Latest statistics on enterprise bargaining. 2017 has been a year of progress with 50 of the 60 enterprise agreements put to a ballot this year being voted up. Large agencies such as the Department of Human Services, the Department of Defence and the Australian Taxation Office now have new agreements in place. 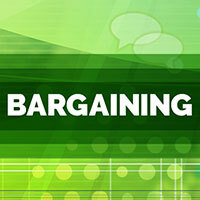 The current bargaining round is drawing to a close. 132 new agreements have been voted up in 122 agencies. The majority of employees in Commonwealth agencies are now covered by new agreements. New agreements have delivered pay rises and generous terms and conditions for employees. These include superannuation entitlements that are significantly above community standards and personal leave entitlements that are double those provided by the National Employment Standards in some cases. Employees continue to have access to generous maternity and parental leave entitlements and are able to negotiate flexible working arrangements to assist in achieving a work life balance. A typical APS4 employee earning the base salary for their classification who voted up an agreement in 2015, offering 6% over three years, is approximately $5,100 better off now. Likewise, a typical APS6 employee is approximately $6,500 better off, and an EL1 employee approximately $8,000 better off. Agencies and employees are benefitting from more streamlined agreements, free of inflexible processes and procedural requirements which act to confine agency operations. Rather than being tied to rigid processes set out in the enterprise agreement for the duration of the agreement, sensible changes can be made along the way to address individual circumstances and changing business needs. Productivity gains such as these benefit the public service as a whole.